A documentary on the Shroud of Turin arrives on Blu-ray 3D. 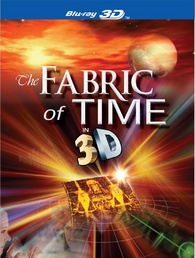 Although the exact release date seems to be a mystery, Grizzly Adams Productions' 'The Fabric of Time - 3D' seems to be available now on Blu-ray 3D. We live in a world where science and religion have often been on opposing sides. But is all that changing? For the first time, science and religion have come together to uncover an age-old mystery. Who was Jesus Christ? What did he actually look like? And can the story of his death and resurrection now be proven as true? Viewers around the world are in the jury box as newly found scientific discoveries are presented by scholars, scientists, and historians in an unflinching search for evidence -- nothing has been held back. Could it be that actual documentation of this amazing story is still available today? Is it possible that a single fiber from an ancient artifact might hold the answers? And has science found a way to unlock the hidden information contained in the artifact that could provide a link to the past—one that might explain the universe in a whole new light and give hope to people around the world? Did Christ leave us physical evidence that only now with quantum leaps forward in science, are we able to understand? Have scientists actually been able to produce a full three dimensional image of Christ? See the evidence and decide for yourself in 'The Fabric of Time': Are the Secrets of the Universe Hidden in an Ancient Cloth? Specs have yet to be revealed, but supplements include Legal Arguments for the Shroud of Turin, Seeing the Unseen, Is the Shroud of Turin a Painting or Not?, Preservation of the Shroud of Turin, and Extended Expert Interviews. Suggested list price for the Blu-ray is $34.98, but it's only $24.95 directly from Grizzly Adams here and be sure to use the coupon code THANKS for an additional $5.00 off. You can find the latest specs for 'The Fabric of Time - 3D' linked from our Blu-ray Release Schedule, where it's indexed under December 6 (for now).